Ellen Taffe Zwilich Interview with Bruce Duffie . . . . . .
Ellen Zwilich (born in 1939) is the recipient of numerous prizes and honors, including the 1983 Pulitzer Prize in Music (the first woman ever to receive this coveted award), the Elizabeth Sprague Coolidge Chamber Music Prize, the Arturo Toscanini Music Critics Award, the Ernst von Dohnanyi Citation, and Academy Award from the American Academy of Arts and Letters, a Guggenheim Fellowship, four Grammy nominations, and, among other distinctions, she has been elected to the Florida Artists Hall of Fame and the American Academy of Arts and Letters. In 1995, she was named to the first Composer's Chair in the history of Carnegie Hall, and she was designated Musical America's Composer of the Year in 1999. A more complete profile from her publisher appears at the bottom of this webpage. 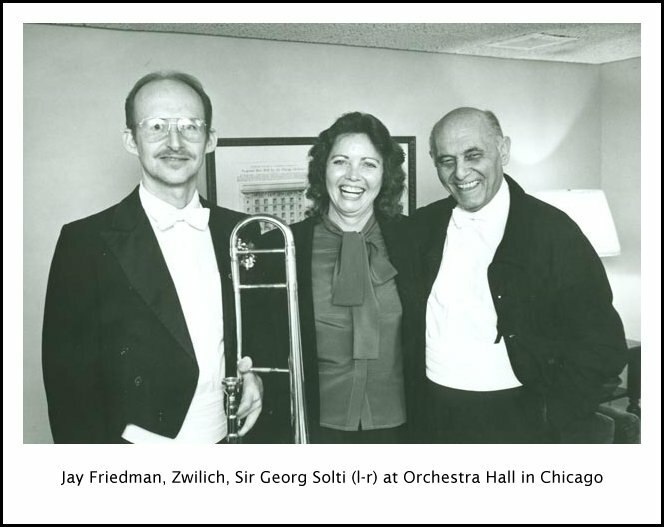 Zwilich was in Chicago in January of 1986 for a performance of her Double Quartet. I was permitted to attend the rehearsal that afternoon, after which we went back to her hotel for our conversation. Naturally, we began by discussing the specific work being done that evening . . . . .
Bruce Duffie: Why eight strings — why not four, why not six, why not piano, why not voice? Ellen Taaffe Zwilich: Why not, indeed? [Laughs] This was written for the Chamber Music Society of Lincoln Center. Charles Wadsworth, who’s their Artistic Director, and I met about this commission. They have a rather large complement of Society members, and he was telling me this possibility, that possibility. I wanted to write a large scale work for a sizable number of players, and one of the ideas he threw out was, “We have the Emerson String Quartet in residence and we have another quartet of Society members.” I had kind of an immediate flash, and thought that was a wonderful sounding idea! BD: When that flash came, did it flash your music or did it flash the Mendelssohn Octet? ETZ: Oh, no. It just seemed to me a very intriguing combination. The thing that intrigued me was the idea of using the Emerson Quartet vis-à-vis another quartet. So I let this idea simmer a little bit, and by the next day I had lots of musical ideas about it and a very strong sense that I wanted to do this. The reason I called it a double quartet and not an octet is that a part of the piece is about the relationship of the two quartets. Before I even started it, I went so far as to go down to Tully Hall and move chairs around the stage to get a visual impression of where people would sit, and an audio impression of where sound would be coming from. They sit facing one another, with the cellos side by side at the back. Another way to set up a string octet is like a little string orchestra, with the violins together, for example, and the violas and the cellos. But I really wanted to do something involving the two groups. BD: It gave you more possibilities, perhaps? ETZ: Well, maybe not. It just gives you a different dramatic situation. In the first movement it’s really just an octet, except that everything, all of the material, is done twice. Where it’s introduced in one quartet, it returns in the other. The whole piece is absolutely equal, equally spread between the two quartets. There is no such thing as a second quartet; they’re both the first quartet. In the second movement you began to have a kind of a contest between the same instrument. That starts with the two cellos contesting each other and developing a musical line. It then goes throughout the whole ensemble, where you have, for example, the violins paired against their opposite in the other quartet, in a kind of a duel. BD: It’s really a conflict rather than an interaction? ETZ: In the third movement particularly, it’s a kind of a conflict. All of the movements have both conflict and interaction, but in the third one the battle lines are a little bit drawn! [Both laugh] There are exchanges between the two quartets that come very rapidly, sometimes very, very quickly. Then in the fourth movement it all blends — not only the two quartets, but then the focus even moves toward the quartet of violins and the quartet of the lower instruments. There’s a shift of focus. This is all just one aspect of the piece. It was something that I enjoyed doing, and it was very interesting to me. But probably above all, it’s a piece growing out of an initial musical idea of that particular material. For the first concert of its regular subscription season yesterday at Alice Tully Hall, the Chamber Music Society of Lincoln Center put together a program without a weak link. Besides sharply honed performances of three familiar masterpieces, there was the world premiere of Ellen Taaffe Zwilich's Double Quartet for Strings, a work commissioned by the society. Although it kept fast company in its first appearance, Mrs. Zwilich's score not only held up its head but made a powerful impression throughout its 4-movement, 18-minute length. However, credentials do not count for much once the music begins. What did count in Mrs. Zwilich's piece, beyond the expert use of compositional devices and the clever manipulation of string techniques and sonorities, was the sense of concentrated emotion that it conveyed. This was a composer intent on communing with her audience and in full command of the technical means to do so. The score took a variety of formal approaches to the problem of combining and contrasting the two string quartets, one of them the resident Emerson String Quartet and the other a foursome drawn from the society's general roster of artist-members. The first movement, which treated the eight players as a cohesive unit, specialized in Stravinskyish ostinatos, motoric repetitions of simple rhythmic ideas both plucked and bowed. Meanwhile, supple melodic lines intertwined overhead. There was strength and vigor in the music, as well as a striking way of blending dissonance and consonance in what suggested patterns of deep, heavy breathing. An equally weighty, brooding Lento pitted instruments against one another. This was followed by an intense Allegro Vivo that suggested Bartók's middle quartets as an inspiration. The Adagio finale, though simpler in means than what went before it, breathed the same air. The dissonance level remained high, but the Adagio did not at any time scorn sensuous string tone. In fact, throughout her piece Mrs. Zwilich displayed clear-eyed maturity and a rare sense of balance. She writes music that pleases the ear and yet has spine. By John von Rhein, Music critic. String quartet playing is supposed to be a harmonious business, although there is no telling what will happen when eight talented, temperamental string players, half of them men, half women, decide to pool musical resources. That is precisely what occurred Monday evening at the Civic Theatre, where the Orford String Quartet and the Colorado Quartet played a more-or-less joint concert under the auspices of Chamber Music Chicago. The fact that the four male musicians of the Orford are Canadian while the four young women of the Colorado are Americans led one to expect a kind of international battle of the sexes. 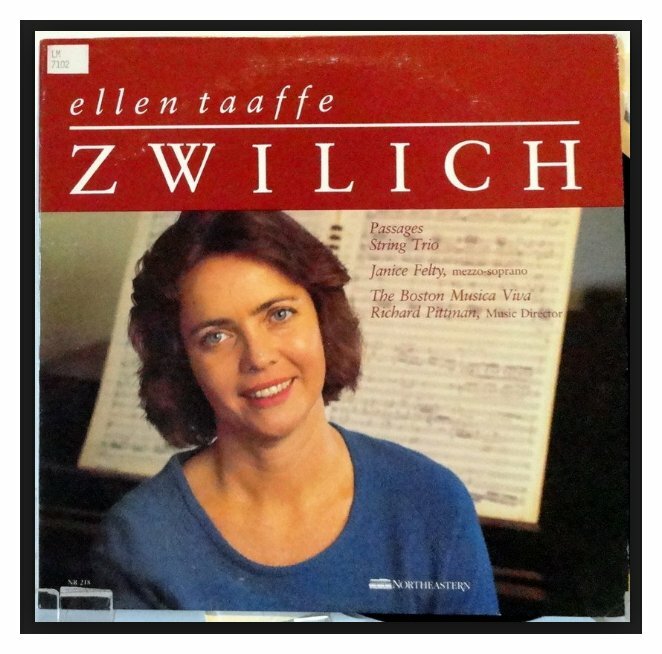 Apart from the third movement of Ellen Taaffe Zwilich`s Double Quartet for Strings, in which the two groups purposely squared off in heated antiphonal dialogue, however, no such battle ever took place. In fact, the ensembles turned out to be nicely complementary in style, a virtue that the Zwilich work managed to exploit to richly resonant advantage. BD: When you get a commission, do they generally give you specifics, or do you look for a commission and say, “I’d like to write this”? ETZ: Both. Usually a part of any commissioning agreement is the instrumentation. In this case, where they have so many instrumentalists in the Chamber Music Society, we had agreed that I would take a commission, but we hadn’t agreed on the instrumentation until we sat down and discussed it. BD: What does winning the Pulitzer Prize do for you as a composer? ETZ: It helps to let people know that you’re there and you’re writing music. BD: Is it something you should strive for, or is it just something that is bestowed upon you? ETZ: I don’t think anybody should ever strive for prizes. Not that you shouldn’t hope to get them and enter whatever contests and things like this. But we have to have perspective on prizes and awards. Music is too important. The goals of music are much more consuming than that. BD: What, for you, are the goals of music? ETZ: For me, writing music is perhaps the most important thing. Hearing wonderful performances of my music is my ultimate reward, much more so than a prize or certain kinds of honors. I’m not downplaying it. I don’t mean to sound like that, because I’m absolutely thrilled to have the Pulitzer Prize, and it’s very nice to have peer recognition. BD: You’re the first woman to get the Pulitzer Prize. Is that significant, or is it just you are a composer who has won the Pulitzer Prize? ETZ: I have had a great deal more publicity because of being the first woman to win the Pulitzer Prize, and all of this is certainly very good. All I’m saying is that it’s not the essence of what we’re doing. BD: When you’re composing, how much is heart and how much is head? ETZ: [Laughs] The nice thing about music is that when you do it right you can’t make the separation. All I know is that to make music — to play it or to write it — you need a tremendous amount of knowledge. You need a store of information and understanding, and yet if you don’t have something special to say, that doesn’t matter. You can have the most wonderful thing to say, and if you have not the technique to say it, then that’s a bind. So ideally, what happens in music — and I think the reason that we all love music — is that music combines thinking and feeling in a way that is utterly impossible to separate in the finished product. BD: Are you pleased with all of your pieces, or are there some that you’d like to go back and tinker with a little bit? ETZ: I don’t count anything that I wrote before 1971. Pieces are very personal things. If my pieces are out there, it means I believe in them. There are some that are more dear to me than others. BD: So the analogy of each one being a child does not really hold water? ETZ: On one level it does, but on the other hand one has to balance pieces. Sometimes when you have finished a very long, extended piece, perhaps it’s good to step back and write something lighter. In that case you might end up feeling that the lighter piece is less important to you in its essence, and yet it’s important in your development and your life’s work as a composer. ETZ: I think it’s both. BD: Where is the balance, then? ETZ: I don’t know. I don’t see the need to separate the two. In fact it’s almost a modern problem that entertainment has to be mindless and art has to be very, very serious and almost like medicine. If it tastes a little bad, then it’s got to be better for you. These are attitudes that are wholly foreign to people who are in the arts because we’re all both enlightened and entertained by music and the other arts. BD: What do you expect from your audience who comes to hear your piece for the first time? ETZ: I hope they come with a sense of adventure, ready to enjoy the idea that they’re going to hear something that they have never heard before. In a case of a new piece, I hope that they’re sitting in a hall full of people who’ve never heard this piece before. Music is very much a living art, and that’s a very attractive thing about it. The audience member who comes ready to be surprised, or taken somewhere new, or go with a new idea and see where that might lead — this is the ideal listener, the person that’s ready for something a little out of the ordinary. BD: Are audiences today ready for something out of the ordinary? ETZ: Absolutely! They most certainly are. There are several things about music and audiences. They love this sense of adventure — do something new with the Mozart Fortieth Symphony that shows me something new in it, or is a special interpretation, as well as being accurate. Let me hear new pieces. Let me hear old pieces on authentic instruments. Let me hear all kinds of things that inspire my ear. Meanwhile, we must remember that one of the beautiful things about music is that you can return to it over and over. For example, on this program, people that know the Mendelssohn Octet are rewarded in hearing it again. There’s something about music that has so many different levels, that you can hear it again and still find something new in it. There’s something fresh for you. It’s not like a mystery story where you can’t read it again because you know the outcome. It’s like a great novel that you can come back to and find new riches in. So you can never have this with new music because this back-up experience is not there. BD: Do you build into your music something that will last for twenty, thirty, fifty, a hundred years? ETZ: I suppose that we would all be fraudulent if we said no to that question. It sounds a little pretentious to write for the future, but I do think that there is a sense of wanting something that has some staying power, some lasting value. The point I was trying to make about the Mendelssohn is that I think an audience has to come prepared to shift gears — to have the special kind of savoring where you can hear a piece that you’ve heard before and still have it be fresh, and then switch gears to hear a piece that you’ve never heard before. That’s a different sort of adventure. BD: Then is it significant that your piece come first or second on the program? ETZ: I don’t know. On this program I come before the Mendelssohn, but I come after the Brahms. BD: You’re the meat in the sandwich! BD: When a group is playing your music, do they find things in it that you didn’t even know were there? ETZ: I love what people bring to music. For example, in this particular piece, this is a string piece, and there is so much room for expression and creativity on the part of string players, with exactly what kind of sound they make, exactly what kind of articulation they use. BD: You’re a string player, so does that give you a closer relationship with other string players, as opposed to, say, a singer or a pianist? ETZ: Probably, yes. For me, writing for strings is almost like an immediate and direct form of communication because it’s like a native instrument. So writing for strings always has been a very special experience for me, and it means a lot to me. BD: What do you expect of your musicians who play your pieces? ETZ: I expect of them what I think any musician should expect of him- or herself — that they only do music they feel a commitment toward; that they do their best to realize what’s on the page, but that they go a further step and get into the meaning of it, and develop a conception of the piece, an interpretation. I’ve been very fortunate in the performers that I have had do this with my music. It’s just a very thrilling experience for me! BD: Now you say music is a living art, and obviously it lives in the concert hall. Does music also live on the plastic phonograph record? BD: Let me ask you about some of the works of yours which have been recorded thus far. ETZ: My Chamber Symphony, the Violin-Piano Sonata, and a String Quartet from 1974 are on a Cambridge record. That disc is only my music. My String Trio and a work called Passages for soprano and instrumental ensemble are on a Northeastern recording [photo of record jacket at left]. I also have a 1971 song cycle on a Leonardo recording. BD: Now you say nothing before ’71 you’re going to count, so is this that early work? ETZ: That’s the first I count, yes! I’d written quite a bit of music before then — quite a bit — but I never felt that I had gotten what I wanted until then. I’m also excited about an upcoming recording on New World Records which will be coming out in April. The Indianapolis Symphony under John Nelson is doing my First Symphony, Celebration for Orchestra, and Prologue and Variations for String Orchestra. [See my Interview with John Nelson.] I’m very happy about that recording. BD: Have you heard the test pressing to these? ETZ: No, I haven’t heard it yet. BD: Were you involved in the recording sessions? ETZ: Oh, sure! You asked what I want from performers, and nobody has ever recorded my music except people that have played it in concert. That’s by choice. I could probably have a few more recordings or more pieces recorded, but I really think that the recording has to grow out of the performance, rather than the other way around. So these were three pieces that they had quite recently played, and that John Nelson had in his repertoire. So I was involved from that standpoint and I was there for the sessions. BD: How much do you get involved when someone is playing your piece — either a quartet or an orchestra work? ETZ: Especially with a premiere there is a good deal of collaboration between a composer and a performer. Sometimes you can save people time, sometimes you’re both experimenting, and sometimes you just sit back and let them do it. I enjoy putting my pieces into really good performers’ hands, because I find that they have the capacity to grasp what your idea was, and to bring their own imaginations to it. BD: So then it would be a mistake to hand something like this Double Quartet to a junior high school group? ETZ: No, this wouldn’t be good for a junior high school group. BD: What if all of a sudden you got a letter that said, “We played this in junior high school and it was wonderful”? ETZ: Oh, that’s a whole other issue. As a matter of fact, just after I wrote my String Trio in 1982, I realized that I hadn’t, for many, many, many years, written anything that was of modest difficulty. So I wrote a divertimento that does get played quite a bit. The first performance was with people in the Rochester Philharmonic and it sounded brilliant and wonderful, and I’ve heard some performances that were less than brilliant and wonderful. But I’m happy that people are playing it! It’s a living art, and life is not neat and tidy. People should be encouraged to play music, to make music, and it doesn’t have to always be at the highest level. In fact, the one thing that we’ve lost in the electronic age is that people no longer have to sit at the piano and hack their way through Beethoven symphonies in four-hand arrangements. They can have a choice of master interpretations, and yet the person who sits at the piano and hacks their way through it learns something about that piece and can reproduce it — even in a primitive form — and has a more intimate contact with the music than the person that can tell the difference between the Furtwängler and the Toscanini recording, but can’t reproduce it in any form. So as a composer, I’m very happy when people do perform my music at, let’s say, less than the optimum level. But of course for a premiere or an important performance, then the standard has to be very high. ETZ: I am not in control of a lot of my pieces which are printed and distributed. BD: Once you’ve given them to the world, then it’s the world’s property, not yours? ETZ: Yes, and in the most casual ways I find out that I’ve had a performance here or there, and I didn’t even know — sometimes even in New York! I picked up the newspaper and read that somebody was doing my Chamber Symphony about a month ago. I didn’t know about that, and I live there! [Laughs] But that is very gratifying. That’s really wonderful, because that means people are playing my music. BD: Do you spend full-time composing? BD: You don’t do any teaching at all? ETZ: No, I don’t do any teaching. I do like to do things like this, where I come out and do a meet-the-composer kind of program, and meet audiences. Going to performances and working on performances is a very important part of my work. BD: Even though you do not teach, I always wonder if musical composition is something that can be taught, or is it just something that must grow out of an inner passion? ETZ: I think it unquestionably is something that must grow out of an inner passion, but there are all kinds of things that aren’t so inner, and aren’t so passionate that one can learn. I have a great respect for craft, and there’s so much to know and so much to learn. It’s this question of technique; there’s where you come to the inner passion. As to whether another person can be taught to compose, I think another person can be helped to compose, can be aided in bringing out what’s in them and guided in developing the craft of composition. But taught, like you learn a language, or mathematics? I don’t think so. Even mathematics, I don’t know. On a certain level, I don’t know how much you can. There are people that never can get it, and other people that grasp it quickly when they’re children. BD: Is music something that should be grasped? BD: Or is it something that just should be felt, and washed over you in concert? ETZ: Oh, I think it should be all of those things! It should be grasped and felt. Mozart said something about it, that music should have something for the connoisseur and something for the casual listener. There has to be many levels in music. It should have some kind of a surface that does attract you, but it should have a deeper meaning that needs to be grasped. BD: When some string quartet players are playing, very often they will start making extraneous noises. Irvine Arditti of his self-named quartet is an exceptionally loud example. [See my Interview with Irvine Arditti.] I’m sure they’re not aware of it, and yet it becomes part of the musical performance. BD: You don’t object to these sounds? ETZ: Oh, no! This is humans making music. This is wonderful sound! This is why I’m still almost a hundred percent into so-called acoustic instruments rather than electronic instruments. I love that! You hear a little rosin sometimes, and you hear breathing. It is fine as long as it’s not intrusive. BD: Would string concerts then be better on television than radio because you can watch them working? ETZ: I don’t know. It’s an interesting issue, and the problem with it so far has been television sound is so poor. But now that you have the possibility of really high quality sound reproduction and a picture, it’ll be interesting to see. BD: One other thing I noticed when they were rehearsing the pieces earlier today was where the two violins were playing in unison for a moment on a sustained note, it sounded completely different when the vibrato was together and when the vibrato was separate. Is that anything that you would want to control or try to control in performance, or would you just let it happen? ETZ: The whole question of vibrato is a very subtle one, and good chamber music players that play together all the time will do very, very interesting and subtle things with vibrato. They may match, they may purposely not match. In the Double Quartet, for example, there are a few times that I marked the things senza vibrato, where you want a very cool sound that occurs, an almost organ-like sound of strings without vibrato. And I will occasionally mark a passage molto vibrato, but these are very, very imprecise. They’re very imprecise to notate, but good players pay very close attention to it and make decisions about it. BD: Do you get involved in a lot of these markings in your score, or is it basically a clean score with just pitch and duration? ETZ: I try to do as much editing as makes it clear. There are certain things that perhaps somebody would come to after two rehearsals, that you could get them to in the first rehearsal if you used two words. In that case, I’ll use those two words. Editing is something that you can never know enough about — just how far to go, when you’re over-editing, when you’re under-editing. It’s a very interesting part of getting the performance off the page, and I’m very concerned about it. BD: You’ve written some music for voice and chamber group. Does the voice pose any special problems that a violin or a clarinet do not? ETZ: They’re very, very different. The voice is not an instrument. There are people today doing extended vocal techniques, but the voice itself is not really, to my way of thinking, an evolutionary medium. I think it’s very special. It’s a separate area, and I have written mostly instrumental music because that’s the area that most interests me. BD: Is it harder, then, for you to write something for voice, or is it just different? ETZ: Everything’s hard! [Laughs] What I would say is that when I used the voice last, it was in a piece called Passages, and I was considering some very basic human issues. I used the voice in a way fairly close to song in the traditional sense. Now if I say that, I would confuse some people who might hear that and say, “It’s going to sound like a tune that I recognize.” Not so. I use the voice in I hope a more universal way, and use the instruments in a more modern, more virtuosic way. I don’t know if that’s clear. BD: It’s making sense, yeah. I can tell it’s something completely different. ETZ: Oh, it’s quite different, and the addition of words introduces a whole new kind of perception. BD: A lot of singers have complained to me that contemporary composers write for the voice like they’re a clarinet or a fiddle. ETZ: Yes, and it’s not. BD: Glad to hear a composer saying that. ETZ: It’s most definitely not, except for those people that specialize in extended techniques, and they are, in a sense, a kind of instrument. BD: Would you ever write an opera? ETZ: No, I would never write an opera, and I say that with absolute certainty, although inside me somewhere I have a dramatic impulse. BD: You said earlier that music must be dramatic. ETZ: Yes, I think it should be, but instrumental music is incredibly dramatic and powerful. BD: So why no opera? ETZ: Because I think that the theater requires, shall we say, exacts an apprenticeship out of people. You can’t learn how to write an opera by listening to other people’s operas or reading about it. You have to apprentice yourself to the theater and operatic production. I am so happy writing instrumental music, and I have more than a lifetime of things that I want to write. This is where I have spent my apprenticeship, and where I am still learning and growing. I don’t see leaving this field for something where I would not have the time, really, to get the essentials down. The people that are doing best in opera have focused on this, and they go somewhere — and it isn’t necessarily the Chicago Lyric Opera or the Metropolitan Opera in New York. It may be a college campus; it may be a small town. They get in a company and they write. They write little things and then they write bigger things, and they learn their craft the only way you can learn to write music — which is by getting in there, knowing what’s going on and paying those dues. This is something that I would not want to interrupt the course that I’m on to do. BD: You’ve paid your dues in a slightly different direction? ETZ: Yes, I think so. Photo taken at a BMI awards ceremony in 2006. To read my Interview with Charles Wuorinen, click HERE. 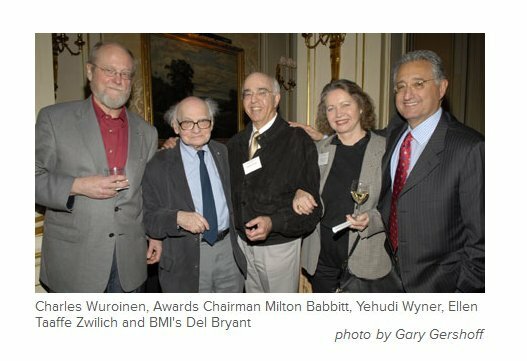 To read my Interview with Milton Babbitt, click HERE. To read my Interview with Yehudi Wyner, click HERE. BD: You like being a composer? ETZ: I love being a composer! I get up in the morning and I think I’m so lucky and privileged to be doing this! I complain about it a lot because it’s often a painful process, but I just feel that I’m living a very privileged, happy life being a composer. BD: And thank you for coming to Chicago. I hope you will come back. ETZ: I’d love to come back! 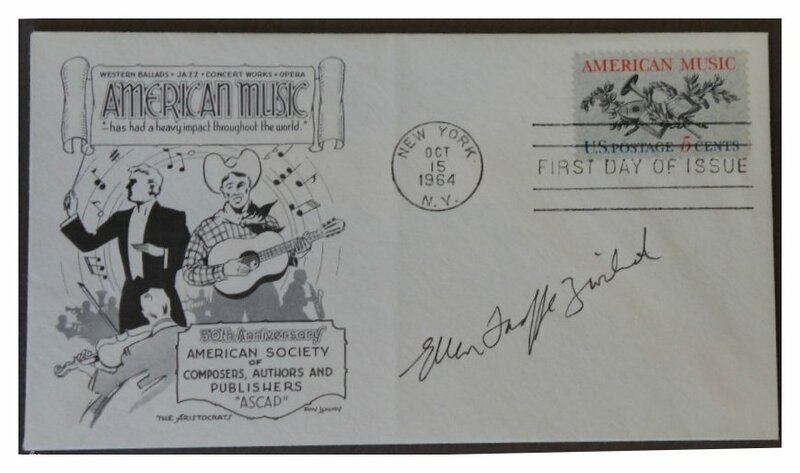 Ellen Zwilich is the recipient of numerous prizes and honors, including the 1983 Pulitzer Prize in Music (the first woman ever to receive this coveted award), the Elizabeth Sprague Coolidge Chamber Music Prize, the Arturo Toscanini Music Critics Award, the Ernst von Dohnányi Citation, an Academy Award from the American Academy of Arts and Letters, a Guggenheim Fellowship, 4 Grammy nominations, the Alfred I. Dupont Award, Miami Performing Arts Center Award, the Medaglia d'oro in the J.B. Viotti Competition, and the NPR and WNYC Gotham Award for her contributions to the musical life of New York City. Among other distinctions, Ms. Zwilich has been elected to the Florida Artists Hall of Fame, the American Academy of Arts and Sciences, and the American Academy of Arts and Letters. In 1995, she was named to the first Composer’s Chair in the history of Carnegie Hall, and she was designated Musical America’s Composer of the Year for 1999. Ms. Zwilich, who holds a doctorate from The Juilliard School, has received honorary doctorates from Oberlin College, Manhattanville College, Marymount Manhattan College, Mannes College/The New School, Converse College, and Michigan State University. She currently holds the Francis Eppes Distinguished Professorship at Florida State University. 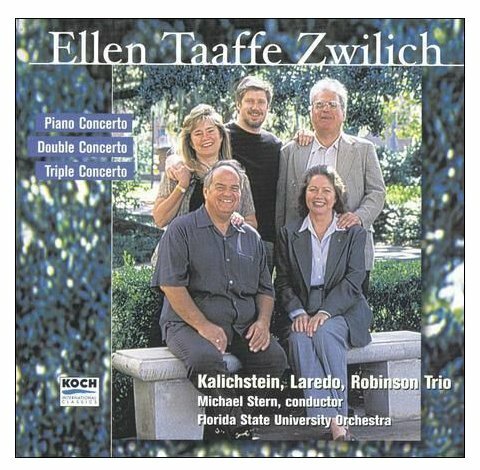 A prolific composer in virtually all media, Ellen Taaffe Zwilich’s works have been performed by most of the leading American orchestras and by major ensembles abroad. Her music first came to public attention when Pierre Boulez conducted her Symposium for Orchestra at Juilliard (1975), but it was the 1983 Pulitzer Prize for the Symphony No. 1 that brought her instantly into international focus. Commissions, major performances and recordings soon followed: the Symphony No. 2 (Cello Symphony), premiered by Edo de Waart and the San Francisco Symphony; Symphony No. 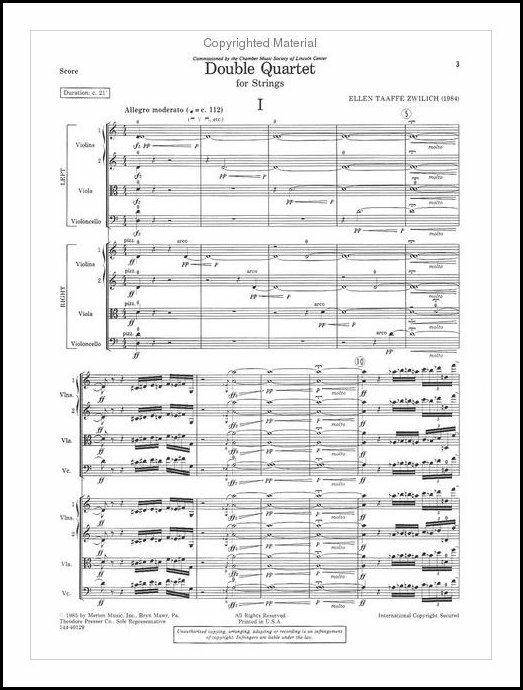 3, written for the New York Philharmonic’s 150th anniversary; Symphony No. 4 "The Gardens" (with chorus), commissioned by Michigan State University and the subject of a PBS documentary seen nationally; the Juilliard-commissioned Symphony No. 5 (Concerto for Orchestra) premiered at Carnegie Hall under James Conlon's direction [shown in photo above]; the string of concertos commissioned and performed over the past two decades by the nation’s top orchestras — for Piano (Detroit Symphony under Günther Herbig), Trombone (Chicago Symphony Orchestra, Sir Georg Solti) [shown in photo below], Flute (Boston Symphony Orchestra, Seiji Ozawa), Oboe (Cleveland Orchestra, Christoph von Dohnányi), Violin and Cello (Louisville Orchestra, Lawrence Leighton Smith), Bass Trombone (Chicago Symphony Orchestra, Daniel Barenboim), French Horn (Rochester Philharmonic, Lawrence Leighton Smith), Bassoon (Pittsburgh Symphony Orchestra, Lorin Maazel), Trumpet (San Diego Symphony, JoAnn Falletta), Triple Concerto for Piano, Violin and Cello (Minnesota Orchestra, Zdenek Macal), Violin (Orchestra of St. Luke’s, Hugh Wolff), and Millennium Fantasy for Piano (Cincinnati Symphony Orchestra, Jesús López-Cobos). 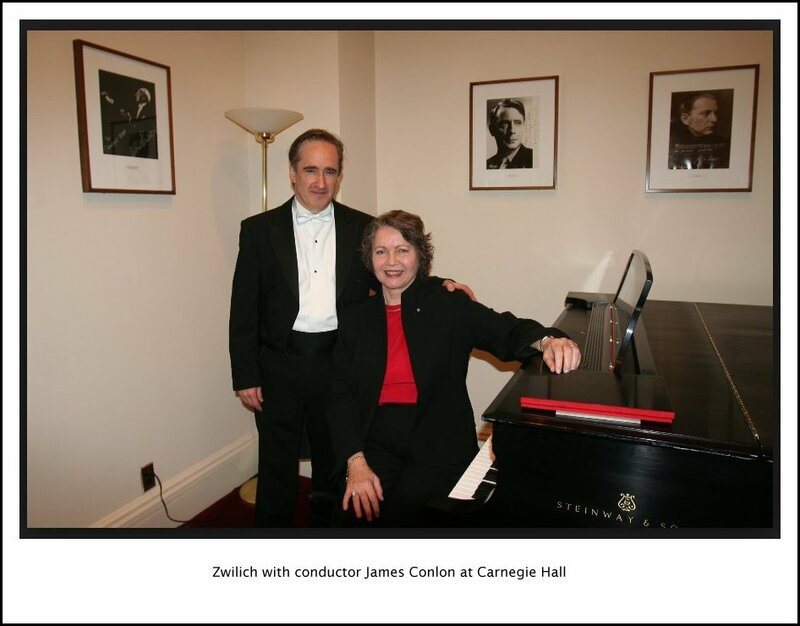 Ms. Zwilich’s most recent concertos include the Clarinet Concerto (2002-2003), written for the Chamber Music Society of Lincoln Center and the Buffalo Philharmonic, conducted by JoAnn Falletta (chamber and orchestral versions, respectively) with soloist David Shifrin; and Rituals (2004) for 5 Percussionists and Orchestra, premiered by IRIS Orchestra under Michael Stern, featuring the renowned Nexus percussion ensemble. 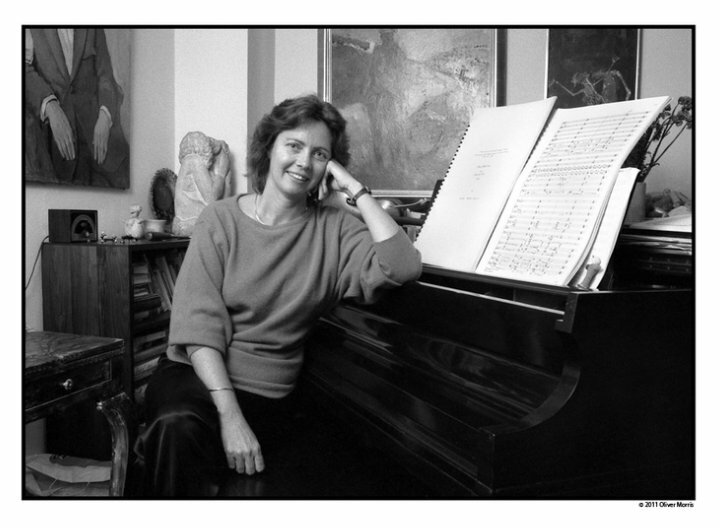 Ms. Zwilich’s chamber works have been commissioned by the Boston Musica Viva (Chamber Symphony, Passages), the Abe Fortas Memorial Fund of the John F. Kennedy Center for the Performing Arts, 92nd Street Y and San Francisco Performances (Piano Trio), the New York State Music Teachers Association (Divertimento), the McKim Fund in the Library of Congress (Romance for Violin), the Santa Fe Chamber Music Festival and Chamber Music Northwest (Clarinet Quintet), the Chamber Music Society of Lincoln Center (Double Quartet and Clarinet Concerto), Carnegie Hall (String Quartet No. 2), Ruth Eckerd Hall for Itzhak Perlman (Episodes for Violin and Piano), the Saratoga Chamber Music Festival (Oboe Quartet), and California EAR Unit (LUVN BLM). The 2007-2008 concert season saw the premiere of Quintet for Alto Saxophone and String Quartet, commissioned by a consortium comprising Arizona Friends of Chamber Music, the Chamber Music Society of Detroit, Fontana Chamber Arts, and Michigan State University. Zwilich has been the subject of two cartoons in the late Charles Schulz’s celebrated Peanuts® series. 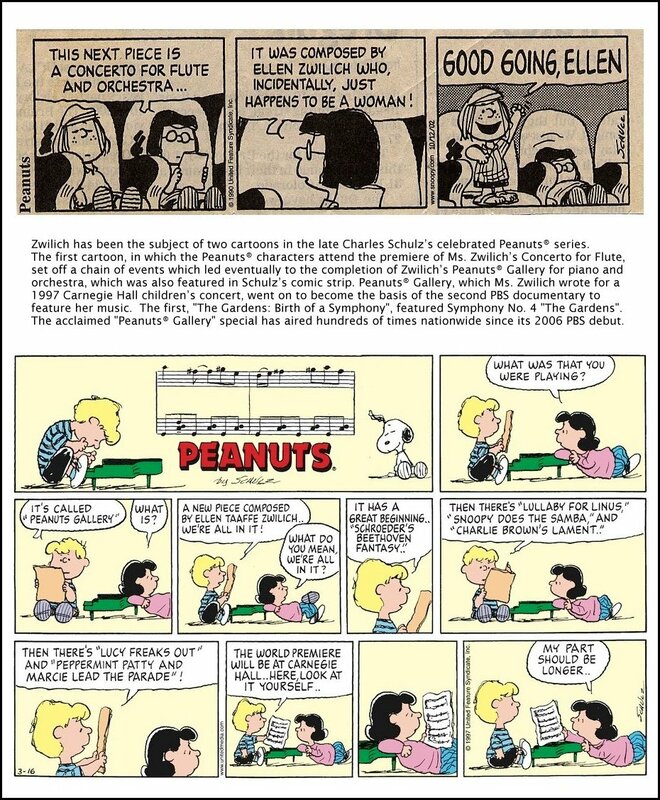 The first cartoon, in which the Peanuts® characters attend the premiere of Ms. Zwilich’s Concerto for Flute, set off a chain of events which led eventually to the completion of Zwilich’s Peanuts® Gallery for piano and orchestra, which was also featured in Schulz’s comic strip. Peanuts® Gallery, which Ms. Zwilich wrote for a 1997 Carnegie Hall children’s concert, went on to become the basis of the second PBS documentary to feature her music (the first, "The Gardens: Birth of a Symphony", featured Symphony No. 4 "The Gardens"). The acclaimed "Peanuts® Gallery" special has aired hundreds of times nationwide since its 2006 PBS debut, and will be rebroadcast during the 2007-2008 season. 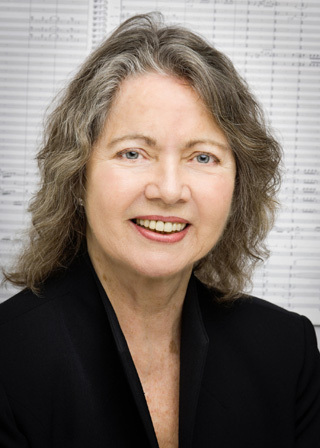 Many of Ellen Taaffe Zwilich’s works have been issued on recordings, and Baker’s Biographical Dictionary of Musicians [8th edition revised by Nicholas Slonimsky] states: "There are not many composers in the modern world who possess the lucky combination of writing music of substance and at the same time exercising an immediate appeal to mixed audiences. Zwilich offers this happy combination of purely technical excellence and a distinct power of communication." -- Names in this box which are links refer to Bruce Duffie's interviews elsewhere on this website. This interview was recorded at her hotel in Chicago on January 13, 1986. Portions were used (with recordings) on WNIB a few weeks later and again at the end of that year, as well as in 1989, 1994 and 1999. A copy of the unedited audio was placed in the Archive of Contemporary Music at Northwestern Univeristy. The transcription was made and posted on this website late in 2013.